Every fall, a magical event takes place in the animal world — the annual monarch migration to Mexico. 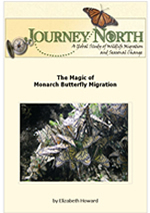 Build a sense of wonder about monarchs and migration. Invite students to be citizen scientists, actively engaged in real-time scientific inquiry with Journey North as your guide. What do you wonder about monarch migration?